2 Sound vs Acoustics The audio community seems to know what “good sound” means. The best two channel recordings made after 1960 sound almost identical to the best made today. The acoustic community has no such agreement. The sound of two highly rated halls can be extremely different. There are no objective measures for sound quality. 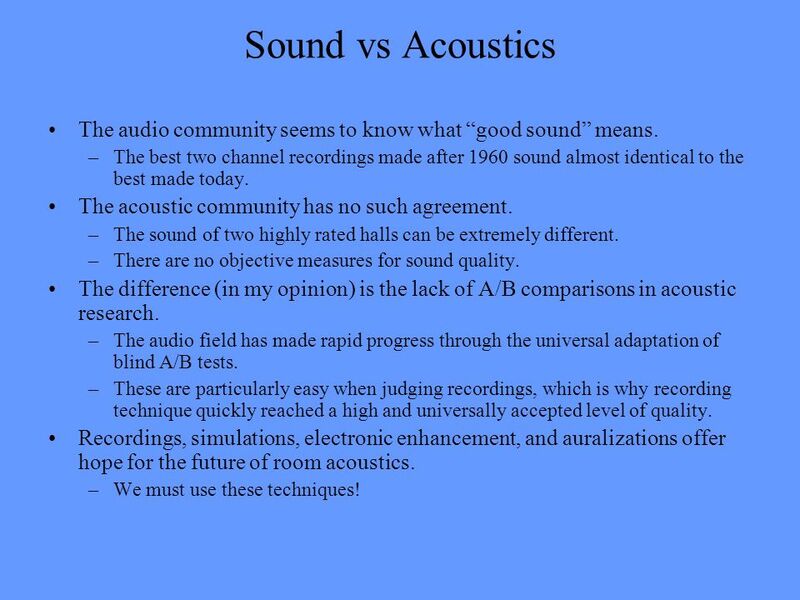 The difference (in my opinion) is the lack of A/B comparisons in acoustic research. The audio field has made rapid progress through the universal adaptation of blind A/B tests. These are particularly easy when judging recordings, which is why recording technique quickly reached a high and universally accepted level of quality. Recordings, simulations, electronic enhancement, and auralizations offer hope for the future of room acoustics. We must use these techniques! 3 Motivation This work was triggered by working in opera houses in Berlin, Amsterdam and Copenhagen. Conductors in these houses wanted a more reverberant sound – “Like the Semperoper Dresden.” With electronic enhancement it was possible to create a “Semperoper” acoustic in these houses, and to compare the result to the unaltered hall using a rapid A/B test with live orchestra and singers. In every case the conductors preferred the unaltered hall to the “Semperoper” acoustic. The preference was NOT based on the accuracy of the simulation, but on the “Sonic Distance” between the singers and the listeners. 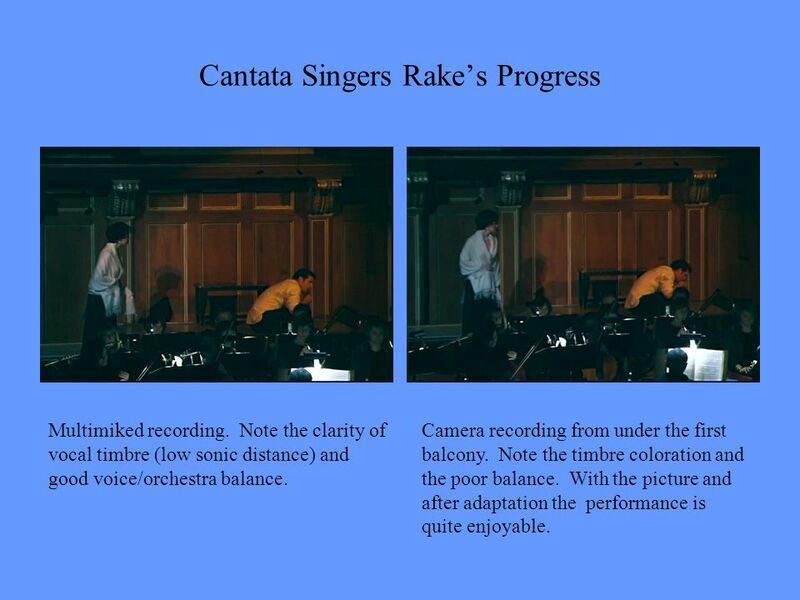 Any reverberation increase that affected the apparent distance of the singers was rejected. By adjusting the frequency dependence of the reverberation it was possible to make a satisfactory compromise. The emotional impact of the orchestra (and the singers) could be substantially increased without reducing the dramatic effect of the acting. The result is artistically desirable, and these systems are in constant use. 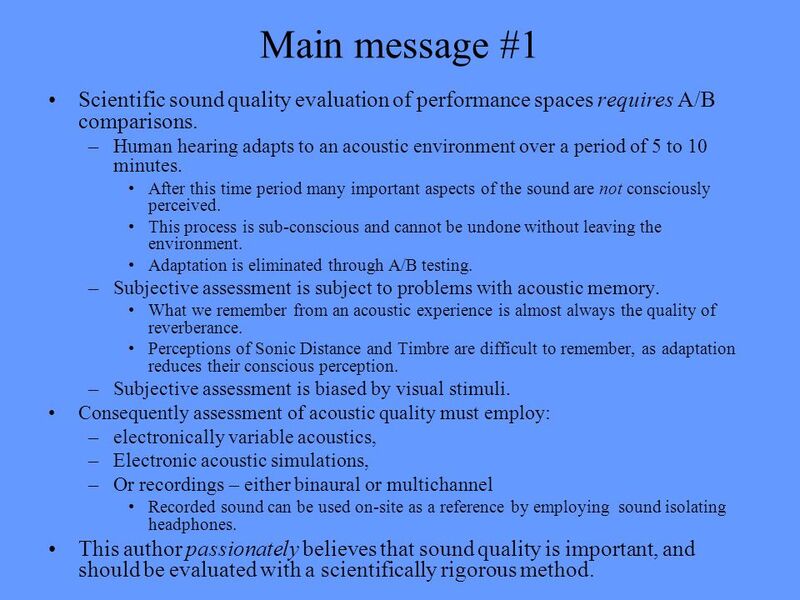 4 Main message #1 Scientific sound quality evaluation of performance spaces requires A/B comparisons. Human hearing adapts to an acoustic environment over a period of 5 to 10 minutes. After this time period many important aspects of the sound are not consciously perceived. This process is sub-conscious and cannot be undone without leaving the environment. Adaptation is eliminated through A/B testing. Subjective assessment is subject to problems with acoustic memory. What we remember from an acoustic experience is almost always the quality of reverberance. 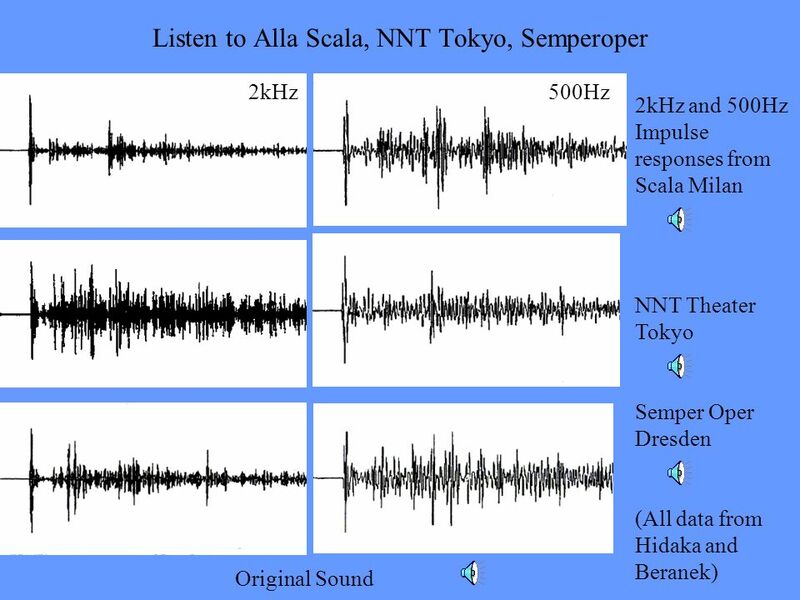 Perceptions of Sonic Distance and Timbre are difficult to remember, as adaptation reduces their conscious perception. Subjective assessment is biased by visual stimuli. Consequently assessment of acoustic quality must employ: electronically variable acoustics, Electronic acoustic simulations, Or recordings – either binaural or multichannel Recorded sound can be used on-site as a reference by employing sound isolating headphones. This author passionately believes that sound quality is important, and should be evaluated with a scientifically rigorous method. 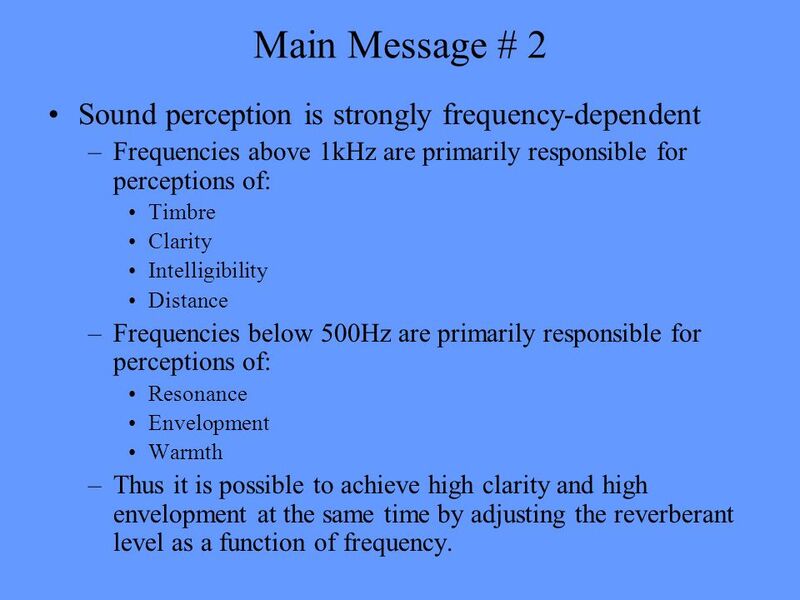 Frequencies above 1kHz are primarily responsible for perceptions of: Timbre Clarity Intelligibility Distance Frequencies below 500Hz are primarily responsible for perceptions of: Resonance Envelopment Warmth Thus it is possible to achieve high clarity and high envelopment at the same time by adjusting the reverberant level as a function of frequency. 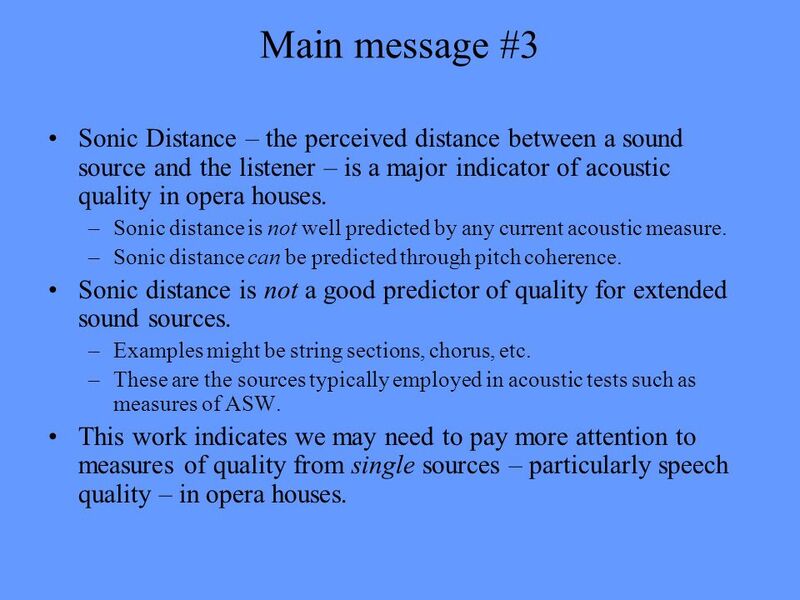 6 Main message #3 Sonic Distance – the perceived distance between a sound source and the listener – is a major indicator of acoustic quality in opera houses. 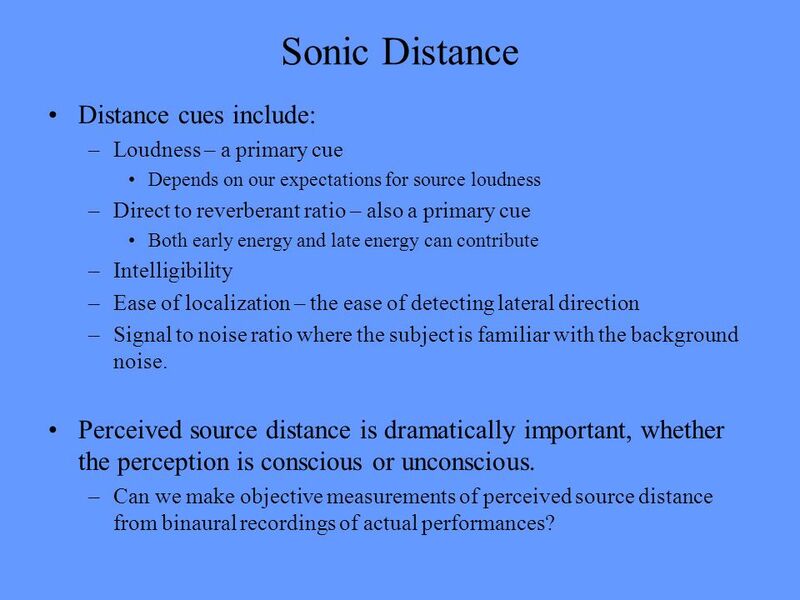 Sonic distance is not well predicted by any current acoustic measure. 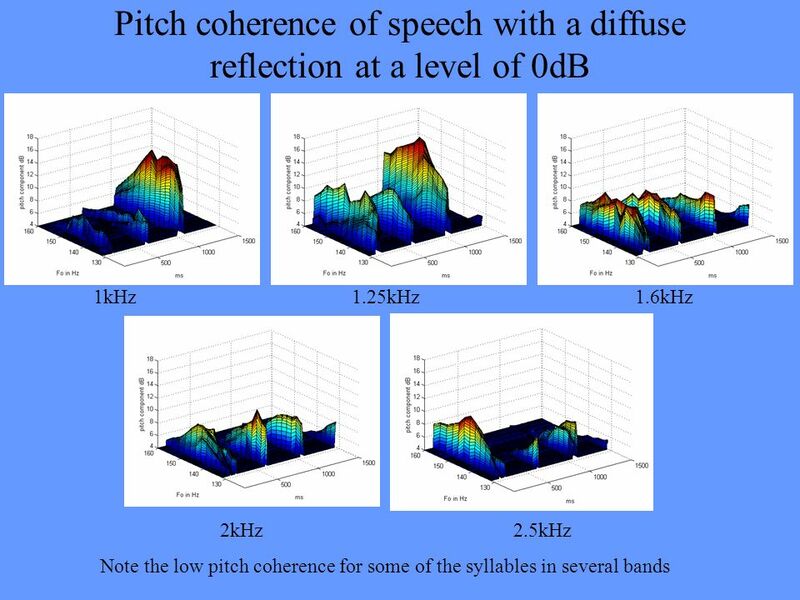 Sonic distance can be predicted through pitch coherence. Sonic distance is not a good predictor of quality for extended sound sources. Examples might be string sections, chorus, etc. These are the sources typically employed in acoustic tests such as measures of ASW. This work indicates we may need to pay more attention to measures of quality from single sources – particularly speech quality – in opera houses. 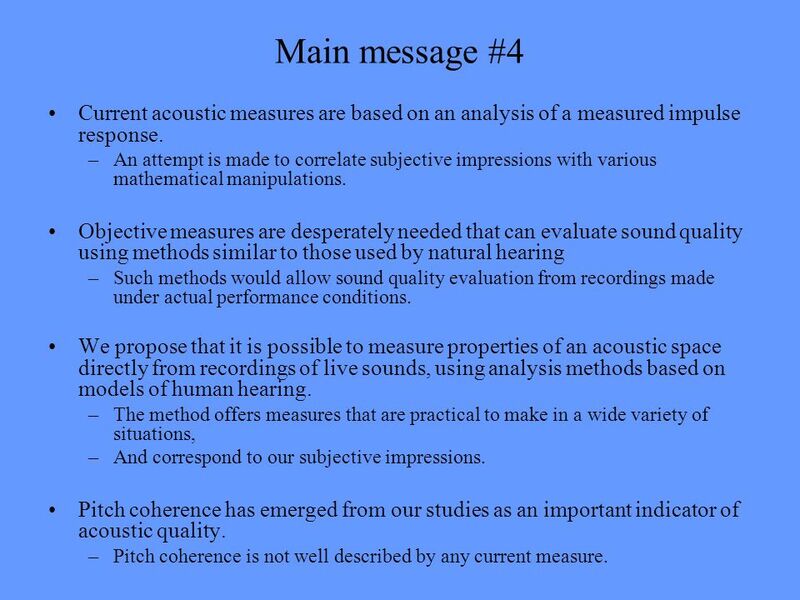 7 Main message #4 Current acoustic measures are based on an analysis of a measured impulse response. An attempt is made to correlate subjective impressions with various mathematical manipulations. Objective measures are desperately needed that can evaluate sound quality using methods similar to those used by natural hearing Such methods would allow sound quality evaluation from recordings made under actual performance conditions. We propose that it is possible to measure properties of an acoustic space directly from recordings of live sounds, using analysis methods based on models of human hearing. The method offers measures that are practical to make in a wide variety of situations, And correspond to our subjective impressions. 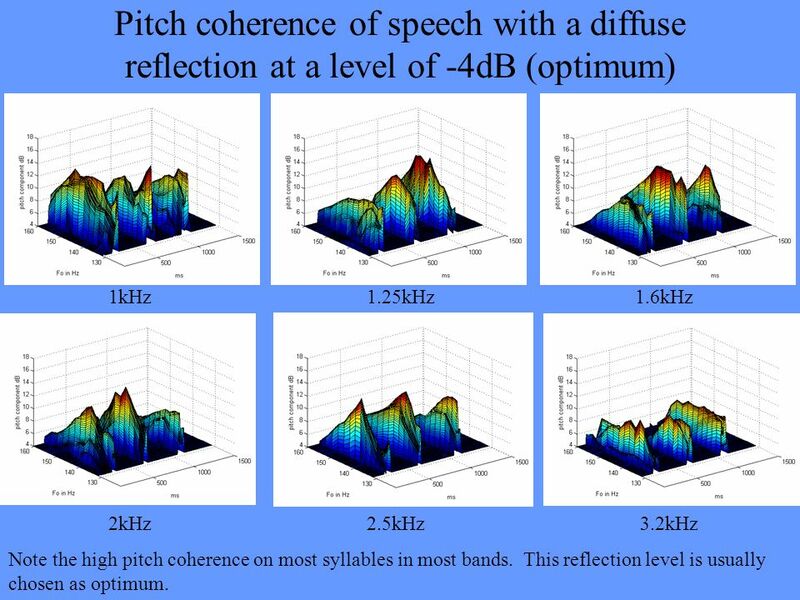 Pitch coherence has emerged from our studies as an important indicator of acoustic quality. 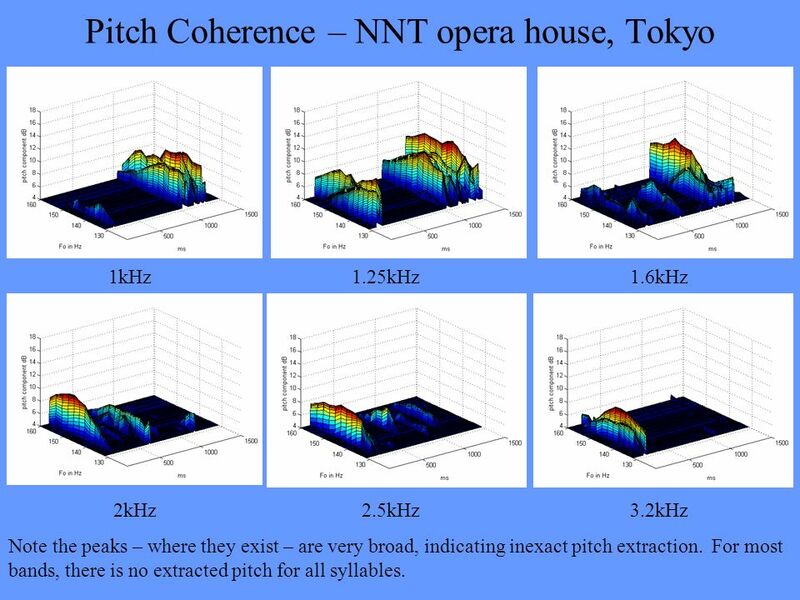 Pitch coherence is not well described by any current measure. Models of hearing are non-linear Acoustic research seems wedded to linear mathematics, the kind that you can easily program in Matlab. Matlab is cumbersome and slow with non-linear problems. 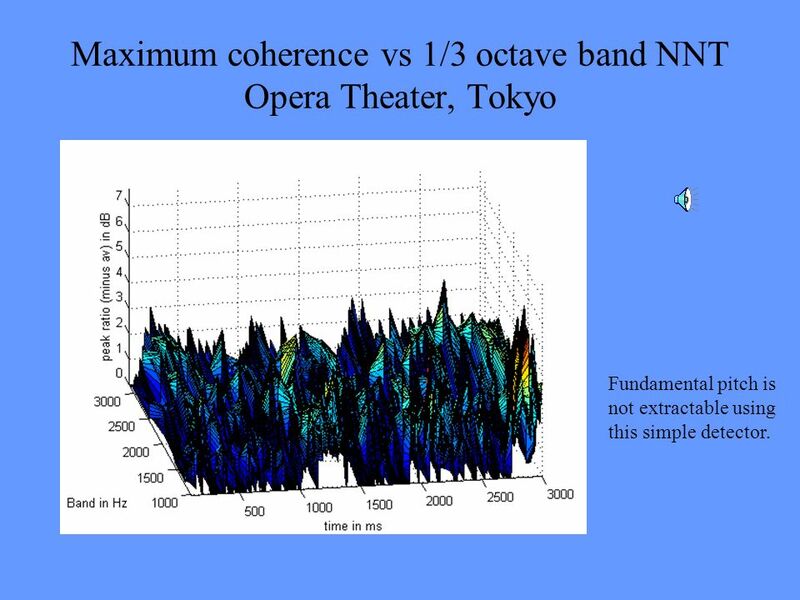 But human hearing is fundamentally non linear – starting with half-wave rectification at the basilar membrane. Models of hearing are messy Small details of programming can result in large differences in the ability of the model to distinguish one type of sound from another. And in the usefulness of the model as a measure. 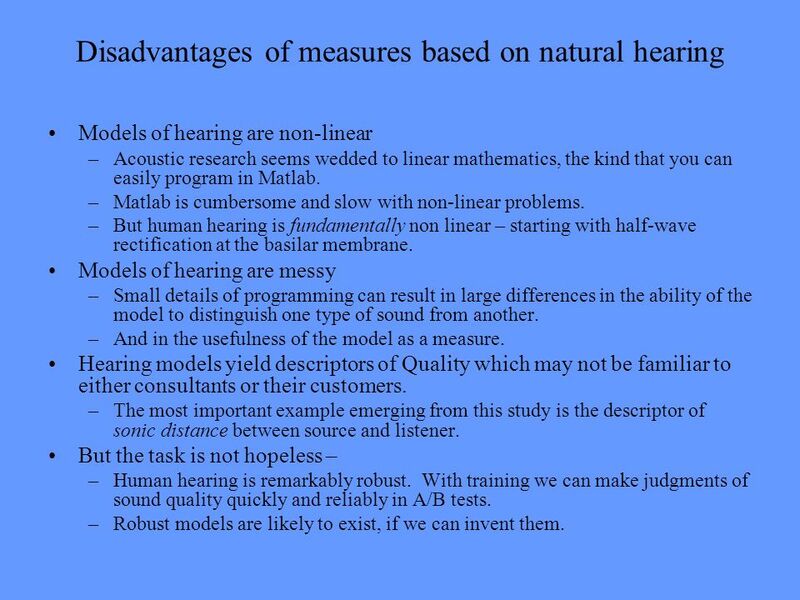 Hearing models yield descriptors of Quality which may not be familiar to either consultants or their customers. The most important example emerging from this study is the descriptor of sonic distance between source and listener. But the task is not hopeless – Human hearing is remarkably robust. With training we can make judgments of sound quality quickly and reliably in A/B tests. Robust models are likely to exist, if we can invent them. 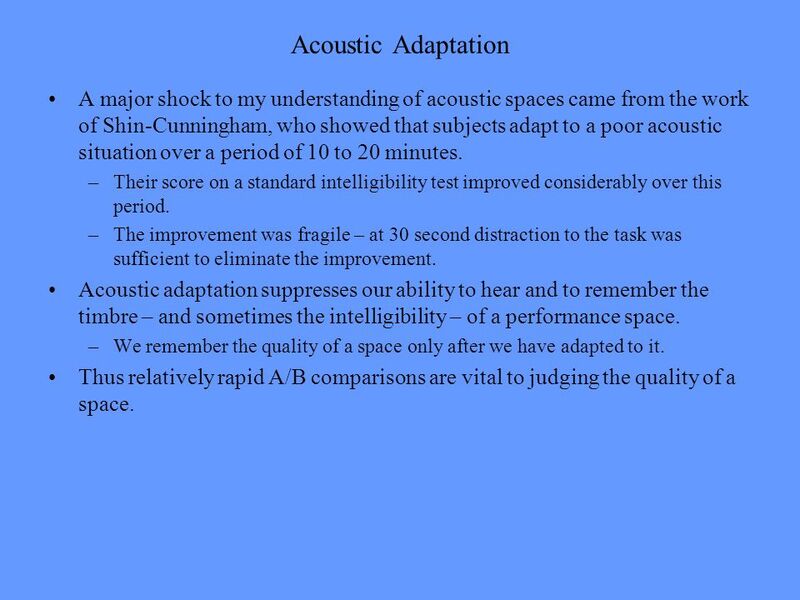 9 Acoustic Adaptation A major shock to my understanding of acoustic spaces came from the work of Shin-Cunningham, who showed that subjects adapt to a poor acoustic situation over a period of 10 to 20 minutes. Their score on a standard intelligibility test improved considerably over this period. The improvement was fragile – at 30 second distraction to the task was sufficient to eliminate the improvement. Acoustic adaptation suppresses our ability to hear and to remember the timbre – and sometimes the intelligibility – of a performance space. We remember the quality of a space only after we have adapted to it. Thus relatively rapid A/B comparisons are vital to judging the quality of a space. 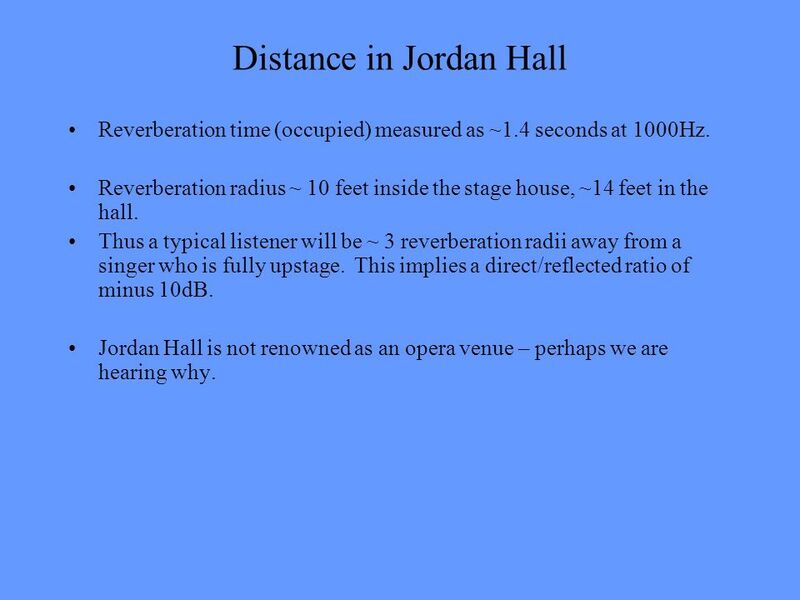 Performance in Jordan Hall, January 26, Reverberation time in Jordan ~1.4 seconds at 1000Hz. This is similar to the Semperoper Dresden. 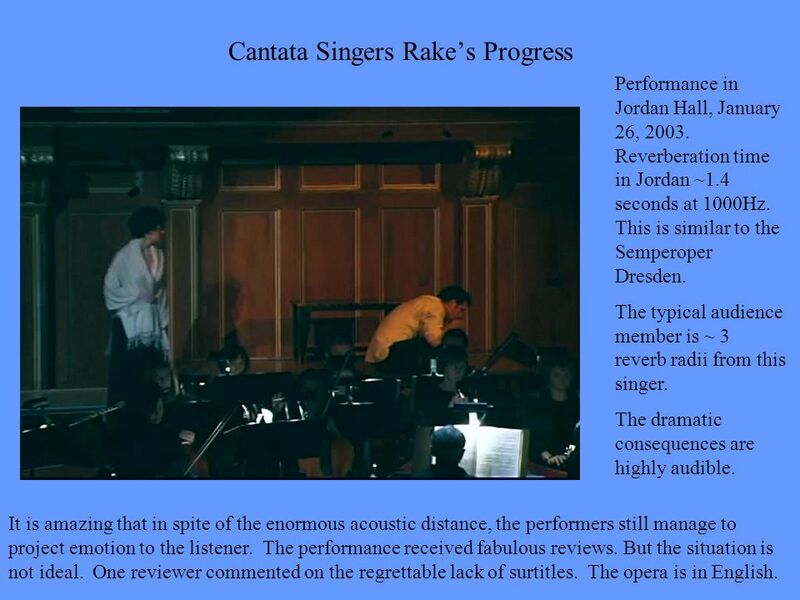 The typical audience member is ~ 3 reverb radii from this singer. The dramatic consequences are highly audible. It is amazing that in spite of the enormous acoustic distance, the performers still manage to project emotion to the listener. The performance received fabulous reviews. But the situation is not ideal. One reviewer commented on the regrettable lack of surtitles. The opera is in English. Multimiked recording. Note the clarity of vocal timbre (low sonic distance) and good voice/orchestra balance. Camera recording from under the first balcony. Note the timbre coloration and the poor balance. With the picture and after adaptation the performance is quite enjoyable. Reverberation time (occupied) measured as ~1.4 seconds at 1000Hz. Reverberation radius ~ 10 feet inside the stage house, ~14 feet in the hall. 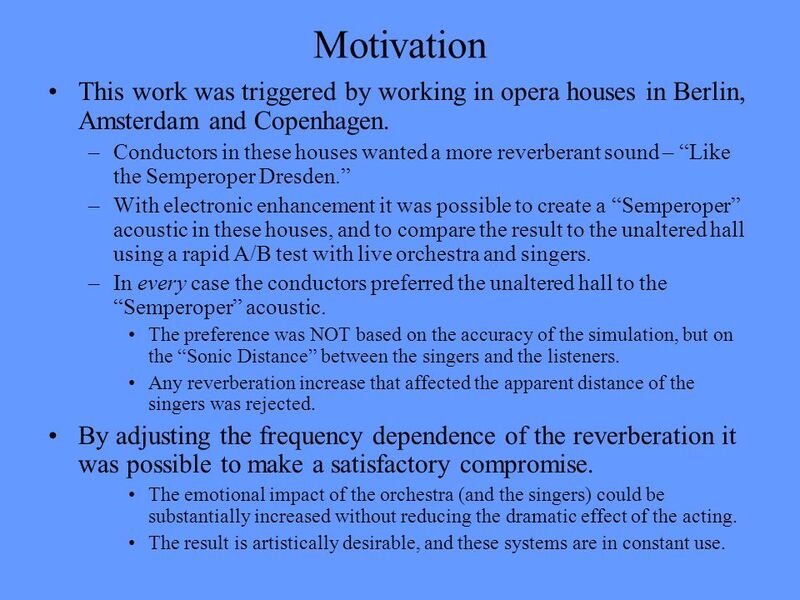 Thus a typical listener will be ~ 3 reverberation radii away from a singer who is fully upstage. This implies a direct/reflected ratio of minus 10dB. 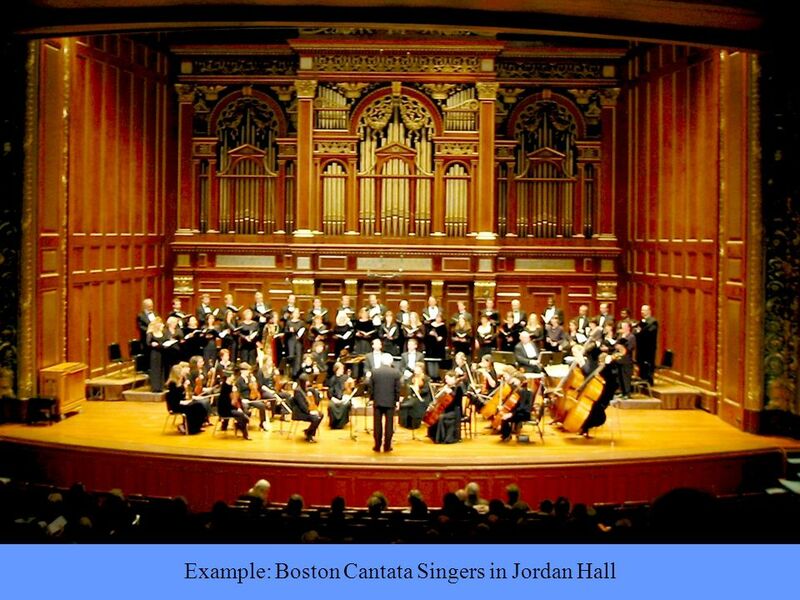 Jordan Hall is not renowned as an opera venue – perhaps we are hearing why. 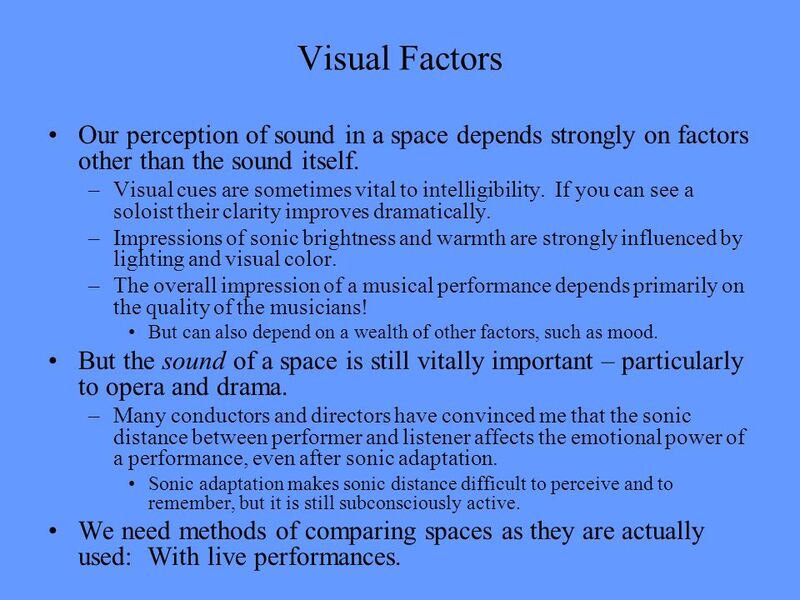 14 Visual Factors Our perception of sound in a space depends strongly on factors other than the sound itself. Visual cues are sometimes vital to intelligibility. If you can see a soloist their clarity improves dramatically. Impressions of sonic brightness and warmth are strongly influenced by lighting and visual color. The overall impression of a musical performance depends primarily on the quality of the musicians! But can also depend on a wealth of other factors, such as mood. But the sound of a space is still vitally important – particularly to opera and drama. Many conductors and directors have convinced me that the sonic distance between performer and listener affects the emotional power of a performance, even after sonic adaptation. Sonic adaptation makes sonic distance difficult to perceive and to remember, but it is still subconsciously active. We need methods of comparing spaces as they are actually used: With live performances. 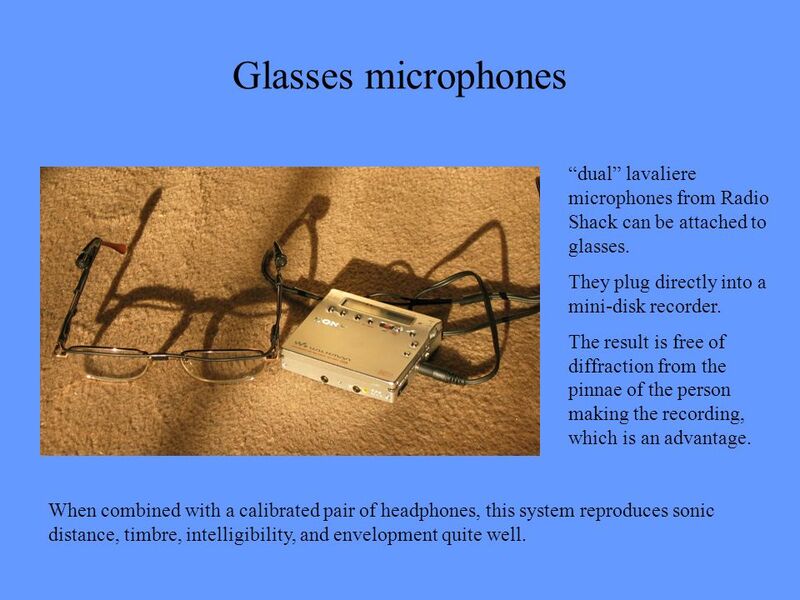 15 Glasses microphones “dual” lavaliere microphones from Radio Shack can be attached to glasses. They plug directly into a mini-disk recorder. The result is free of diffraction from the pinnae of the person making the recording, which is an advantage. When combined with a calibrated pair of headphones, this system reproduces sonic distance, timbre, intelligibility, and envelopment quite well. 16 What constitutes good sound? 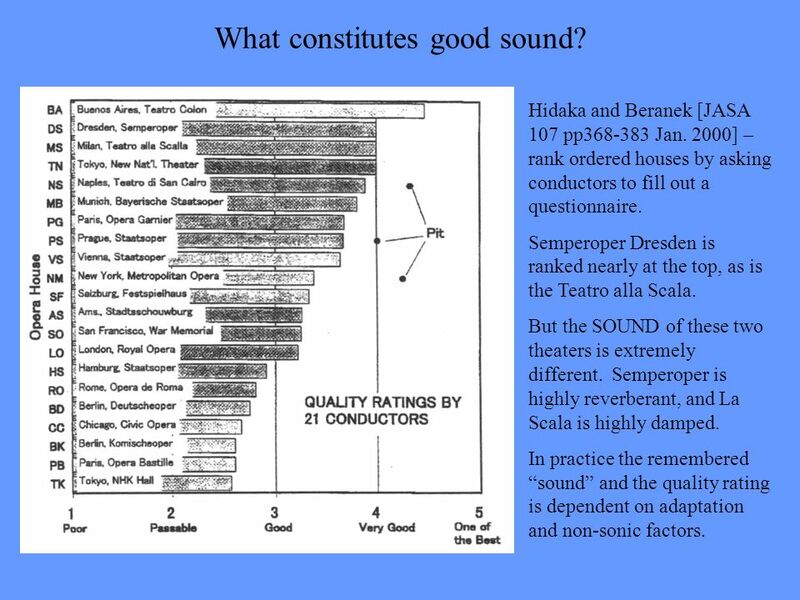 Hidaka and Beranek [JASA 107 pp Jan. 2000] – rank ordered houses by asking conductors to fill out a questionnaire. Semperoper Dresden is ranked nearly at the top, as is the Teatro alla Scala. But the SOUND of these two theaters is extremely different. Semperoper is highly reverberant, and La Scala is highly damped. In practice the remembered “sound” and the quality rating is dependent on adaptation and non-sonic factors. It is very difficult to study opera acoustics, as the sound changes drastically depending on: the set design, the position of the singers (actors), the presence of the audience, and the presence of the orchestra. Binaural recordings made during performances can give us important clues. Here is a short example from the Semper Oper Dresden. This hall was rebuilt in 1983, and considerable effort was expended to increase the reverberation time. The RT is over 1.5 seconds at 1000Hz, which implies a reverberation radius of under 14’. This hall is ranked nearly the best in the survey by Beranek. survey. Note in this recording the singers appear far away, and not well balanced with the orchestra. 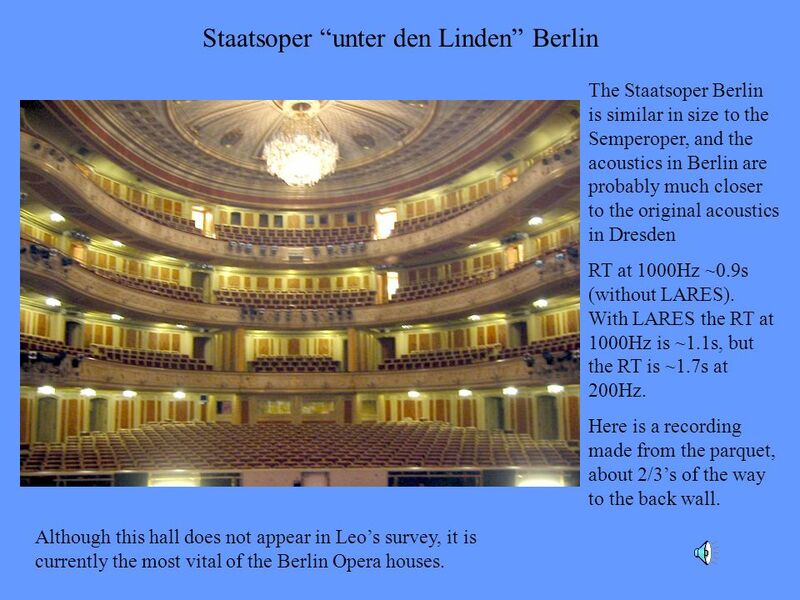 The Staatsoper Berlin is similar in size to the Semperoper, and the acoustics in Berlin are probably much closer to the original acoustics in Dresden RT at 1000Hz ~0.9s (without LARES). With LARES the RT at 1000Hz is ~1.1s, but the RT is ~1.7s at 200Hz. Here is a recording made from the parquet, about 2/3’s of the way to the back wall. Although this hall does not appear in Leo’s survey, it is currently the most vital of the Berlin Opera houses. 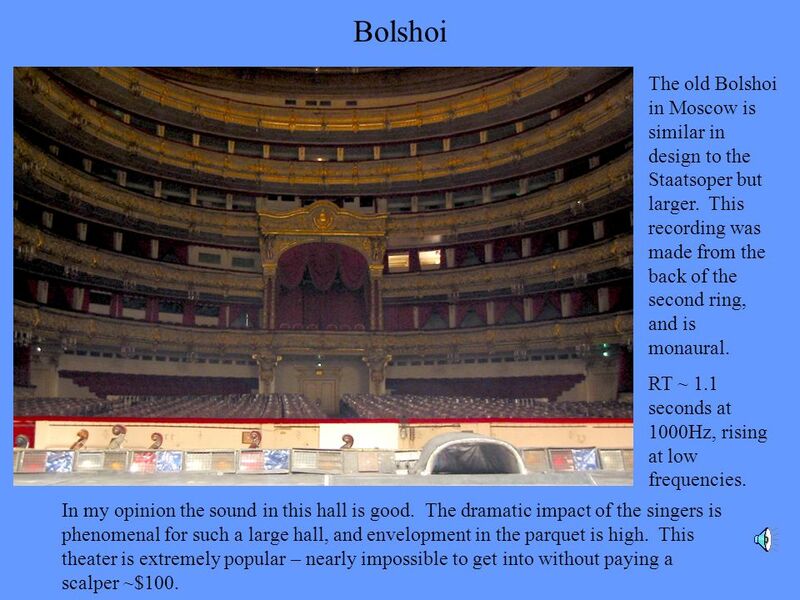 19 Bolshoi The old Bolshoi in Moscow is similar in design to the Staatsoper but larger. This recording was made from the back of the second ring, and is monaural. RT ~ 1.1 seconds at 1000Hz, rising at low frequencies. In my opinion the sound in this hall is good. The dramatic impact of the singers is phenomenal for such a large hall, and envelopment in the parquet is high. This theater is extremely popular – nearly impossible to get into without paying a scalper ~$100. 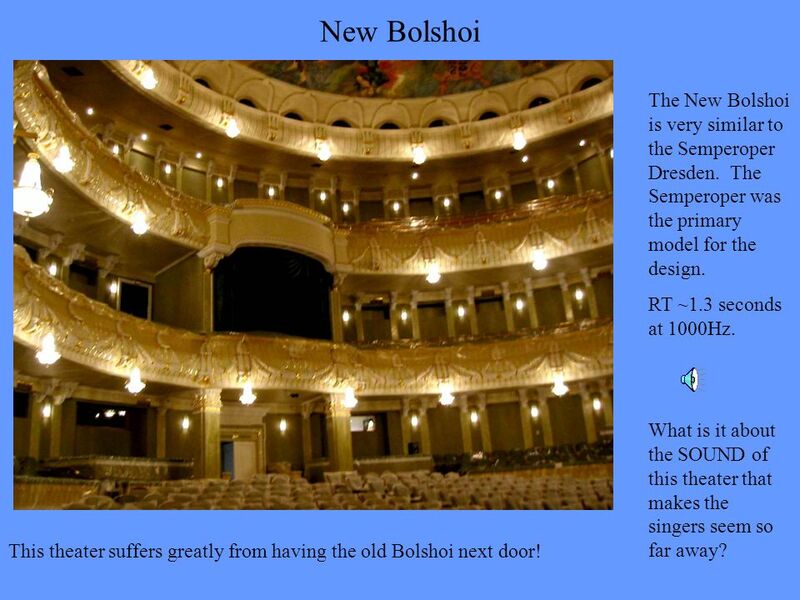 20 New Bolshoi The New Bolshoi is very similar to the Semperoper Dresden. The Semperoper was the primary model for the design. RT ~1.3 seconds at 1000Hz. What is it about the SOUND of this theater that makes the singers seem so far away? This theater suffers greatly from having the old Bolshoi next door! Loudness – a primary cue Depends on our expectations for source loudness Direct to reverberant ratio – also a primary cue Both early energy and late energy can contribute Intelligibility Ease of localization – the ease of detecting lateral direction Signal to noise ratio where the subject is familiar with the background noise. Perceived source distance is dramatically important, whether the perception is conscious or unconscious. Can we make objective measurements of perceived source distance from binaural recordings of actual performances? 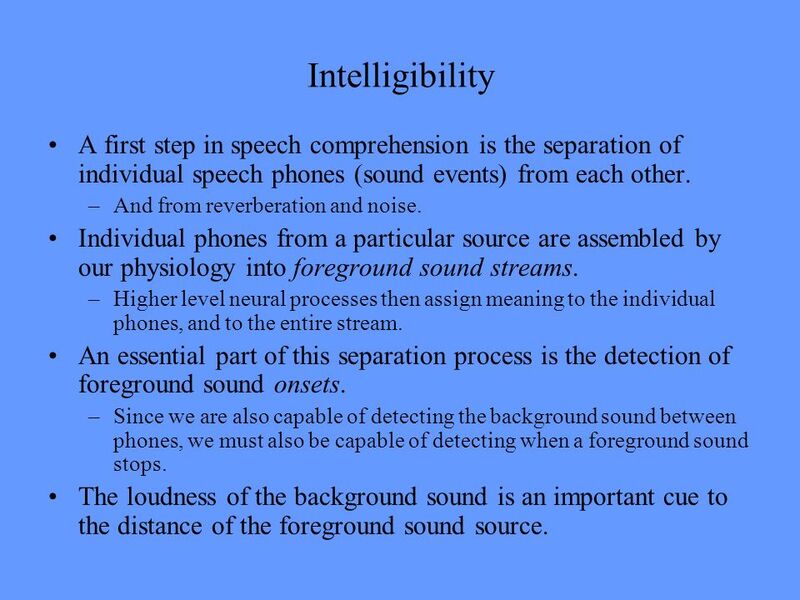 22 Intelligibility A first step in speech comprehension is the separation of individual speech phones (sound events) from each other. And from reverberation and noise. Individual phones from a particular source are assembled by our physiology into foreground sound streams. Higher level neural processes then assign meaning to the individual phones, and to the entire stream. An essential part of this separation process is the detection of foreground sound onsets. Since we are also capable of detecting the background sound between phones, we must also be capable of detecting when a foreground sound stops. The loudness of the background sound is an important cue to the distance of the foreground sound source. Reverb forward Reverb backward Analysis into 1/3 octave bands, followed by envelope detection. Green = envelope Yellow = edge detection By counting edges above a certain threshold we can reliably count syllables in reverberant speech. This process yields a measure of intelligibility. We can then plot the syllable onsets as a function of frequency and time, and count them. 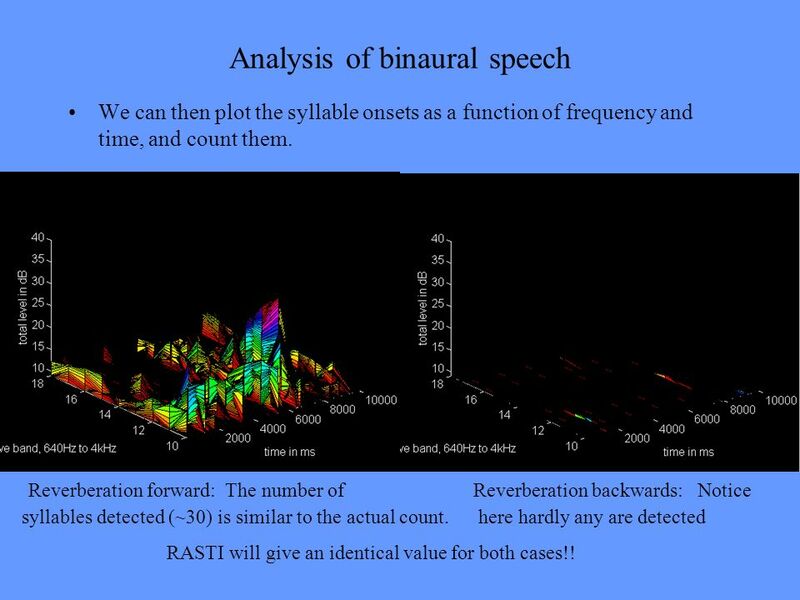 Reverberation forward: The number of Reverberation backwards: Notice syllables detected (~30) is similar to the actual count here hardly any are detected RASTI will give an identical value for both cases!! Start with binaurally recorded speech from an opera house, approximately 10 meters from the live source. 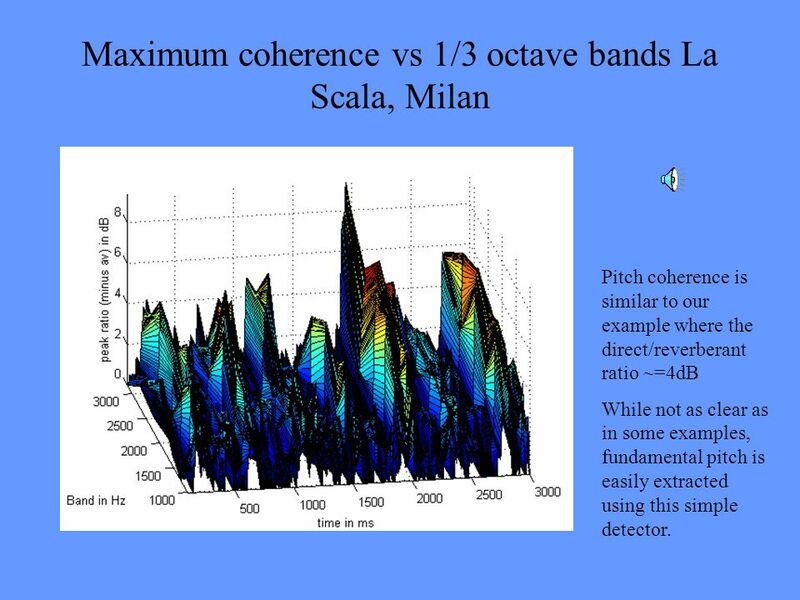 We can decompose the waveform into 1/3 octave bands and look at level and IACC as a function of frequency and time. 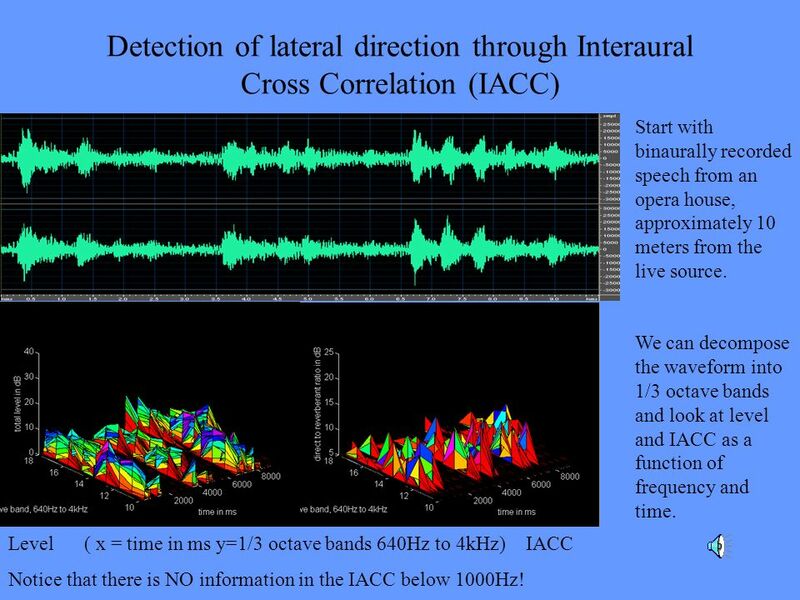 Level ( x = time in ms y=1/3 octave bands 640Hz to 4kHz) IACC Notice that there is NO information in the IACC below 1000Hz! 26 Some details The signal is first filtered into third-octave bands. We can make a histogram of the time offset between the ears during periods of high IACC. 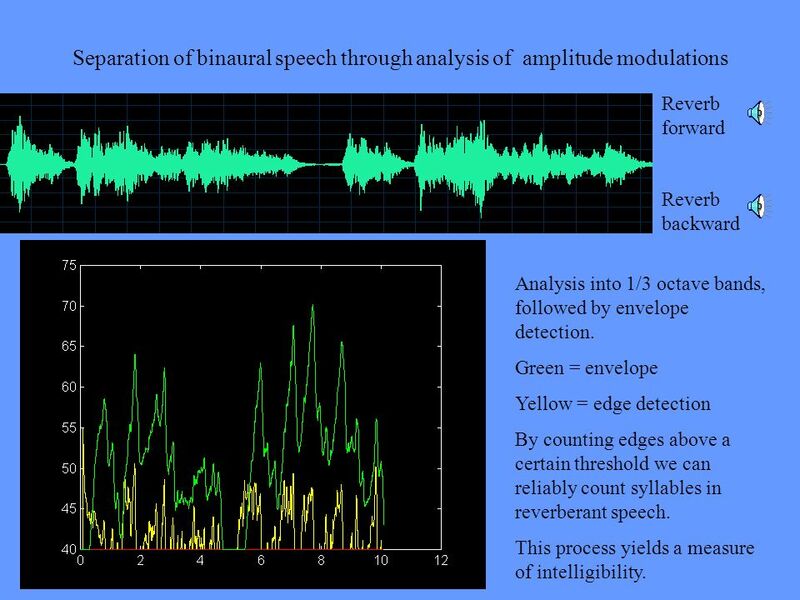 For the segment of natural speech in the previous slide, it is clear that localization is possible – but somewhat difficult. Level displayed in 1/3 octave bands (640Hz to 4kHz) IACC in 1/3 octave bands We can duplicate the sound of the previous example by adding reverberation to dry speech, and giving it a 5 sample time offset to localize it to the right. 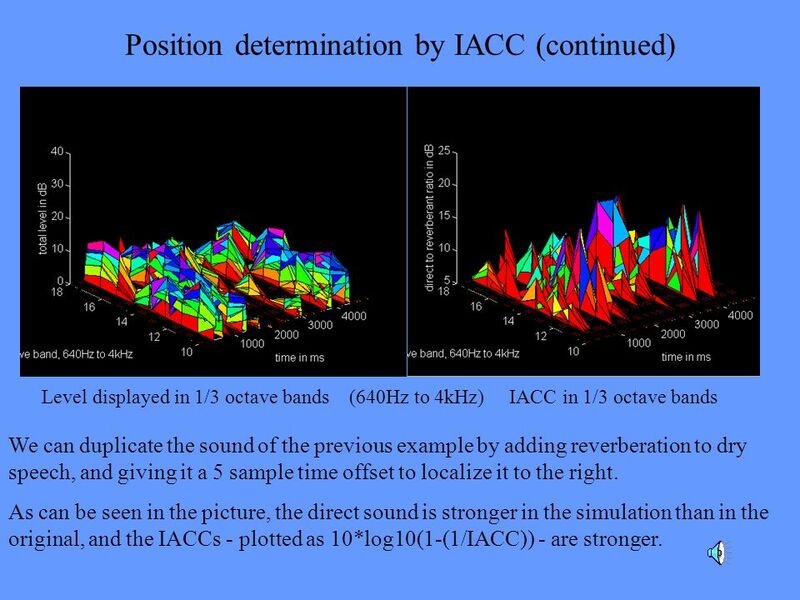 As can be seen in the picture, the direct sound is stronger in the simulation than in the original, and the IACCs - plotted as 10*log10(1-(1/IACC)) - are stronger. 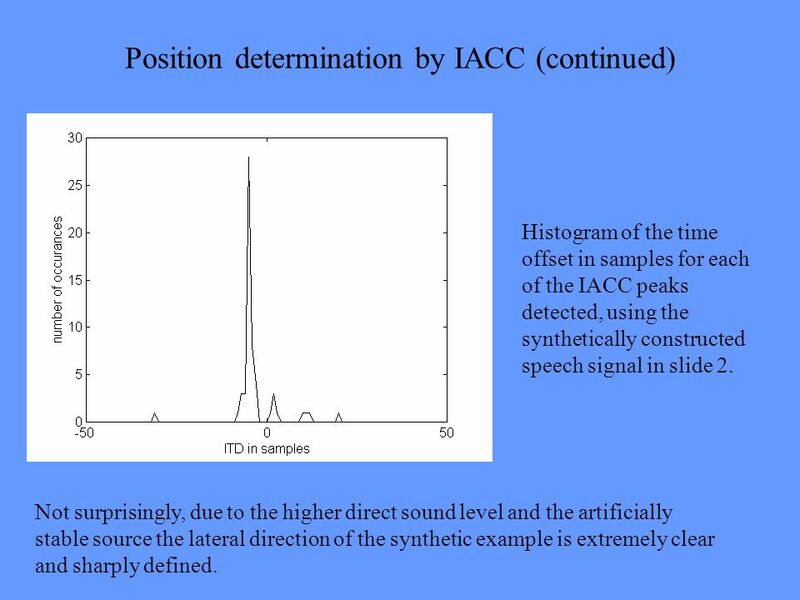 Histogram of the time offset in samples for each of the IACC peaks detected, using the synthetically constructed speech signal in slide 2. Not surprisingly, due to the higher direct sound level and the artificially stable source the lateral direction of the synthetic example is extremely clear and sharply defined. 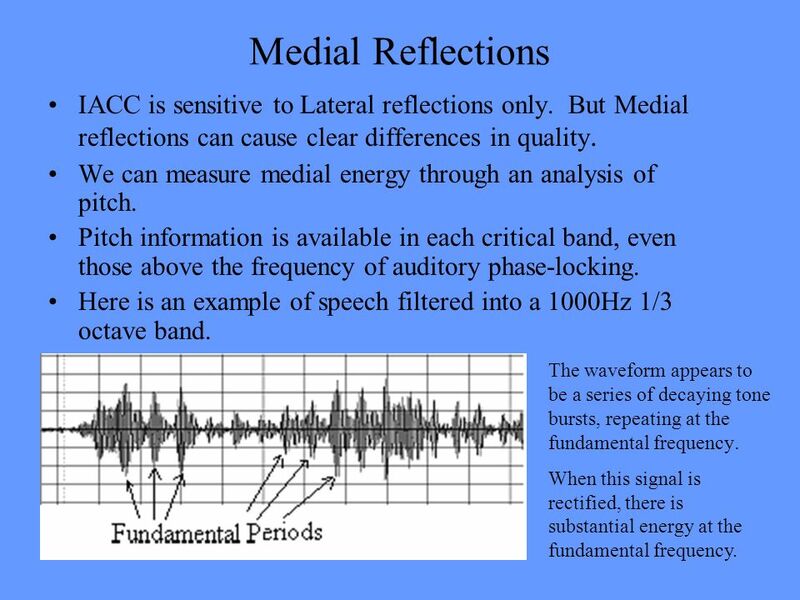 30 Medial Reflections IACC is sensitive to Lateral reflections only. But Medial reflections can cause clear differences in quality. We can measure medial energy through an analysis of pitch. Pitch information is available in each critical band, even those above the frequency of auditory phase-locking. Here is an example of speech filtered into a 1000Hz 1/3 octave band. The waveform appears to be a series of decaying tone bursts, repeating at the fundamental frequency. When this signal is rectified, there is substantial energy at the fundamental frequency. The waveform of the word “five” in the 2kHz 1/3 octave band. The same, but convolved with a 20ms windowed burst of white noise, simulating a diffuse reflection, or the sound of a small reverberant room. 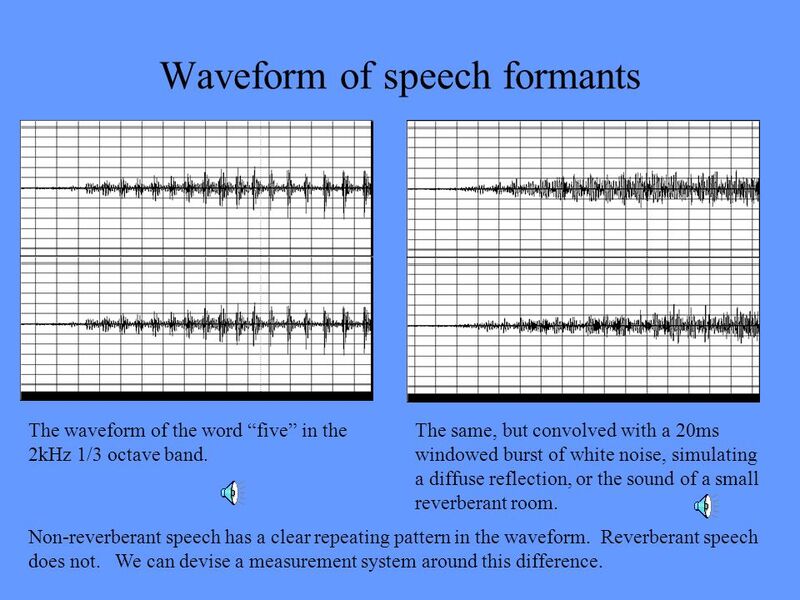 Non-reverberant speech has a clear repeating pattern in the waveform. Reverberant speech does not. We can devise a measurement system around this difference. The pitch detector operates separately on each third octave band. Each band is rectified and low-pass filtered. The output is delayed, and then added and subtracted from the undelayed signal. The logs of the “plus” signal and the “minus” signal are then subtracted from each other. The result has a high sensitivity to fundamental pitch. 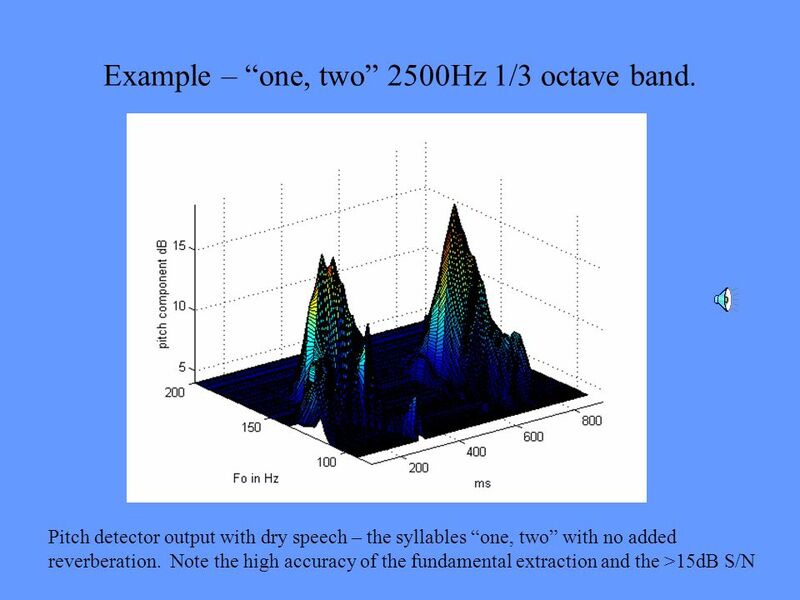 33 Example – “one, two” 2500Hz 1/3 octave band. Convolving with white noise does not change the intelligibility, nor the C80, but dramatically changes the sound – and the pitch coherence. By chance the second syllable is not seriously degraded, but the first one is – at least in this 1/3 octave band The sound quality is markedly degraded. We need a measure for this perception. 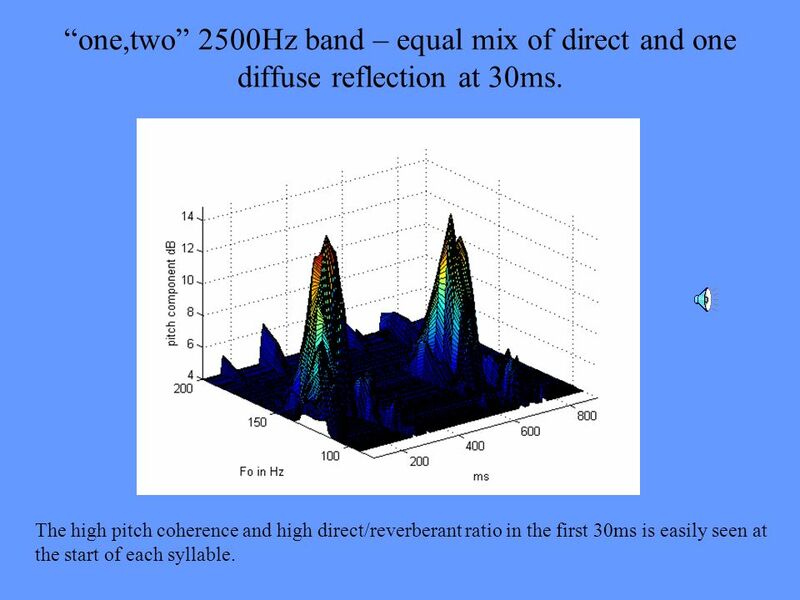 35 “one,two” 2500Hz band – equal mix of direct and one diffuse reflection at 30ms. 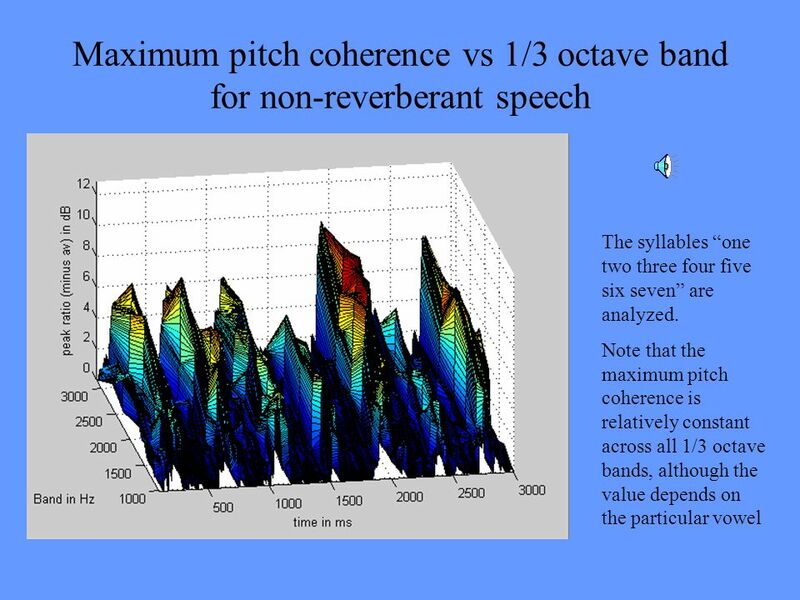 The high pitch coherence and high direct/reverberant ratio in the first 30ms is easily seen at the start of each syllable. Segment from the old Bolshoi Segment from the new Bolshoi. (I was unable to produce a similar plot.) 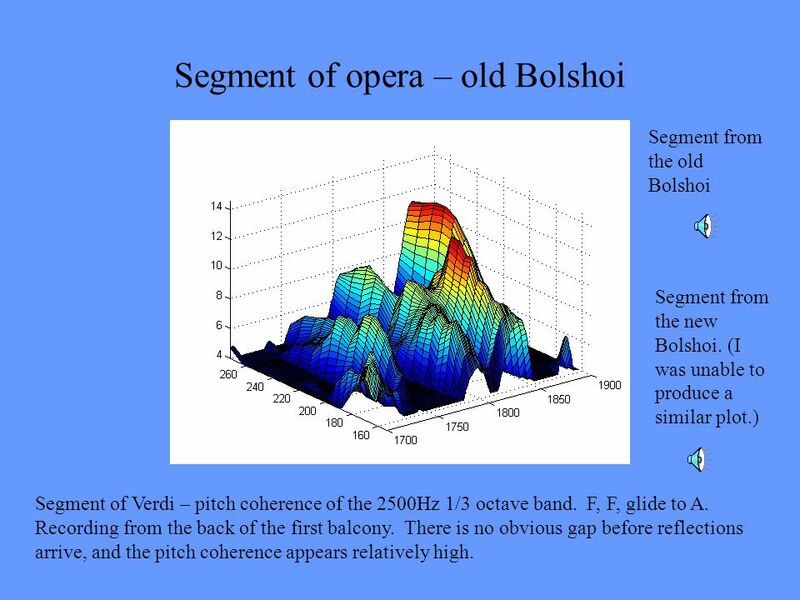 Segment of Verdi – pitch coherence of the 2500Hz 1/3 octave band. F, F, glide to A. Recording from the back of the first balcony. There is no obvious gap before reflections arrive, and the pitch coherence appears relatively high. 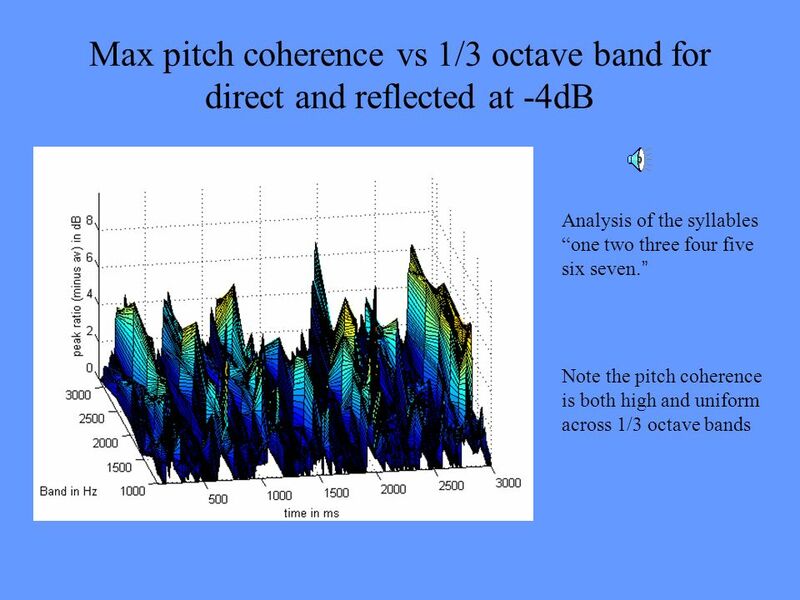 1kHz 1/3 octave band kHz kHz 2kHz kHz kHz Note the height and frequency of the pitch coherence peaks are (almost) uniform through all bands. 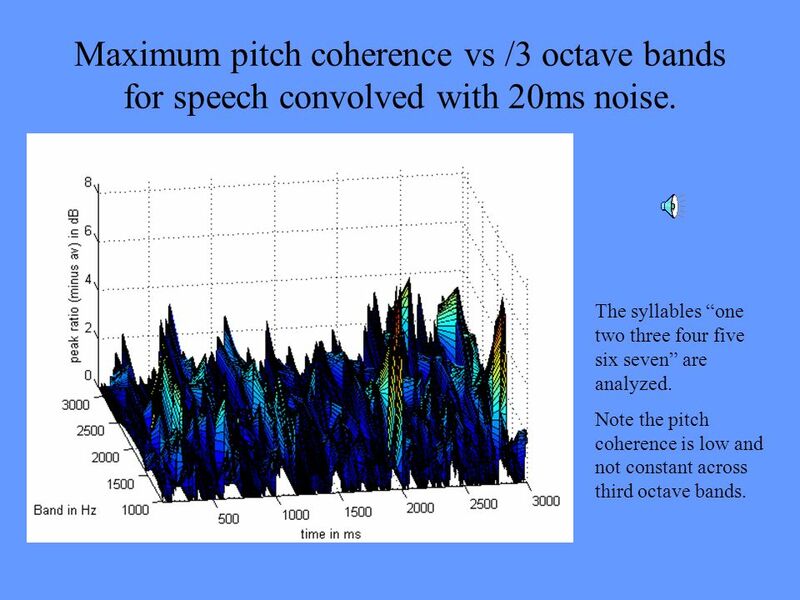 40 Maximum pitch coherence vs /3 octave bands for speech convolved with 20ms noise. The syllables “one two three four five six seven” are analyzed. 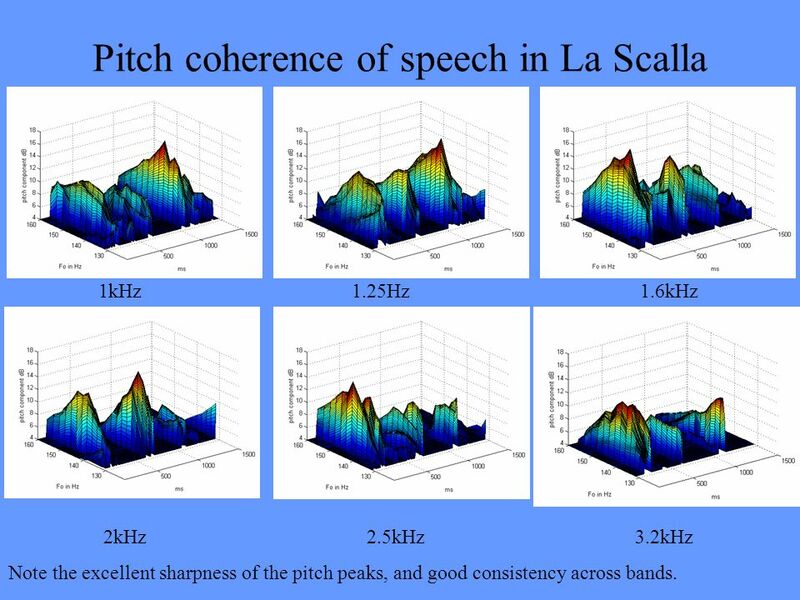 Note the pitch coherence is low and not constant across third octave bands. Analysis of the syllables “one two three four five six seven.” Note the low and noise-like coherence for most of the syllables. 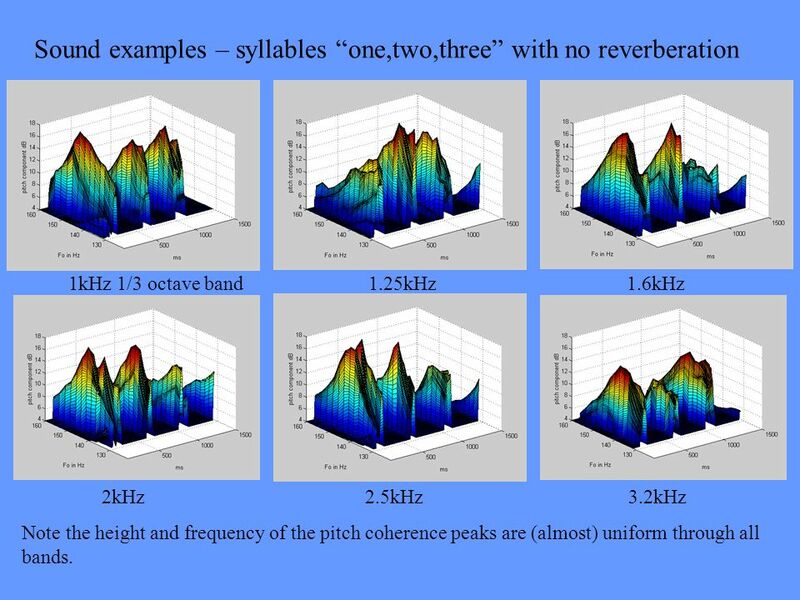 1kHz kHz kHz 2kHz kHz kHz Note the high pitch coherence on most syllables in most bands. This reflection level is usually chosen as optimum. 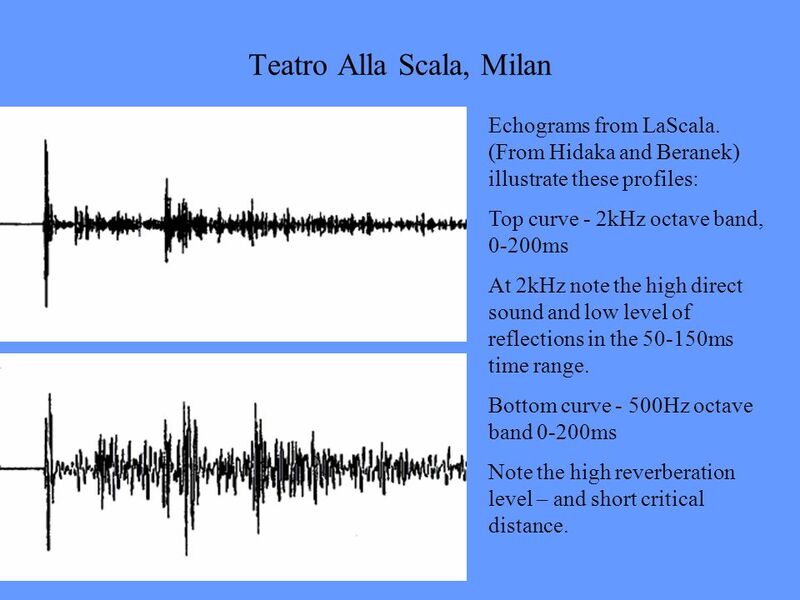 Echograms from LaScala (From Hidaka and Beranek) illustrate these profiles: Top curve - 2kHz octave band, 0-200ms At 2kHz note the high direct sound and low level of reflections in the ms time range. Bottom curve - 500Hz octave band 0-200ms Note the high reverberation level – and short critical distance. 46 Let’s listen to Alla Scala! 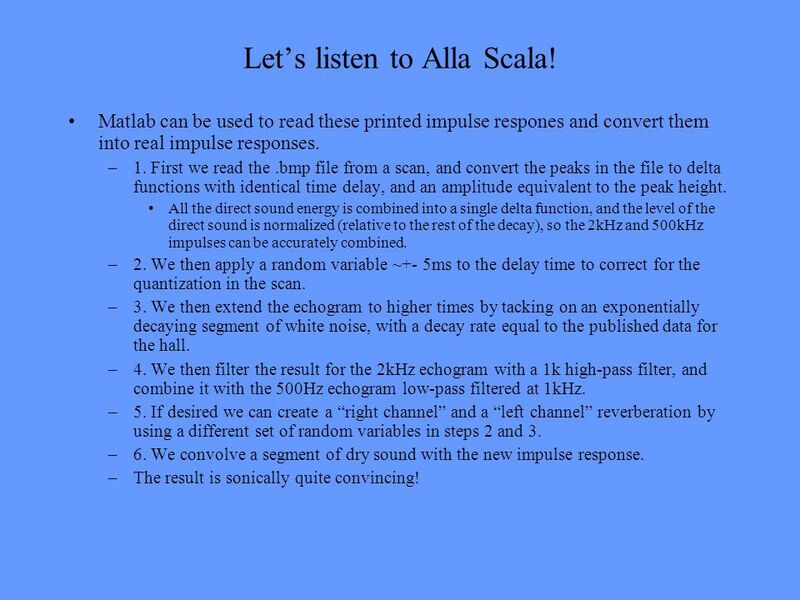 Matlab can be used to read these printed impulse respones and convert them into real impulse responses. 1. First we read the .bmp file from a scan, and convert the peaks in the file to delta functions with identical time delay, and an amplitude equivalent to the peak height. All the direct sound energy is combined into a single delta function, and the level of the direct sound is normalized (relative to the rest of the decay), so the 2kHz and 500kHz impulses can be accurately combined. 2. We then apply a random variable ~+- 5ms to the delay time to correct for the quantization in the scan. 3. 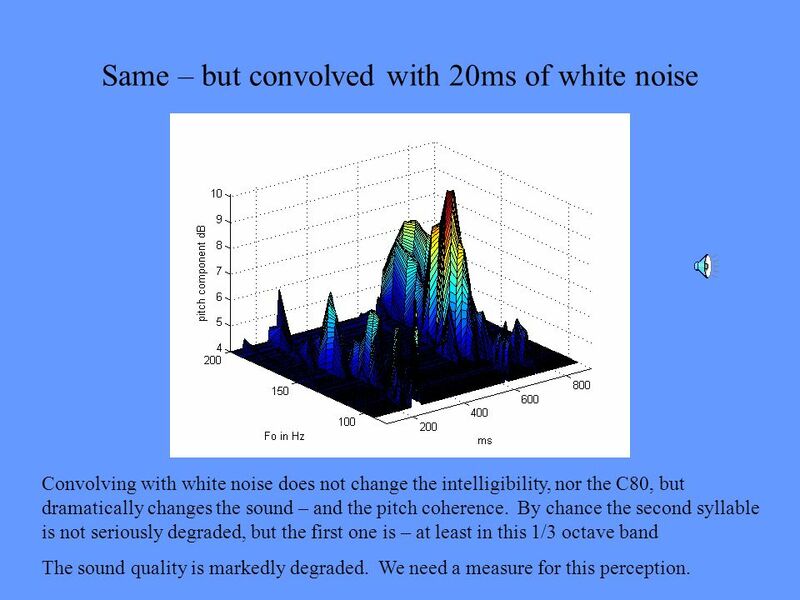 We then extend the echogram to higher times by tacking on an exponentially decaying segment of white noise, with a decay rate equal to the published data for the hall. 4. We then filter the result for the 2kHz echogram with a 1k high-pass filter, and combine it with the 500Hz echogram low-pass filtered at 1kHz. 5. If desired we can create a “right channel” and a “left channel” reverberation by using a different set of random variables in steps 2 and 3. 6. We convolve a segment of dry sound with the new impulse response. The result is sonically quite convincing! 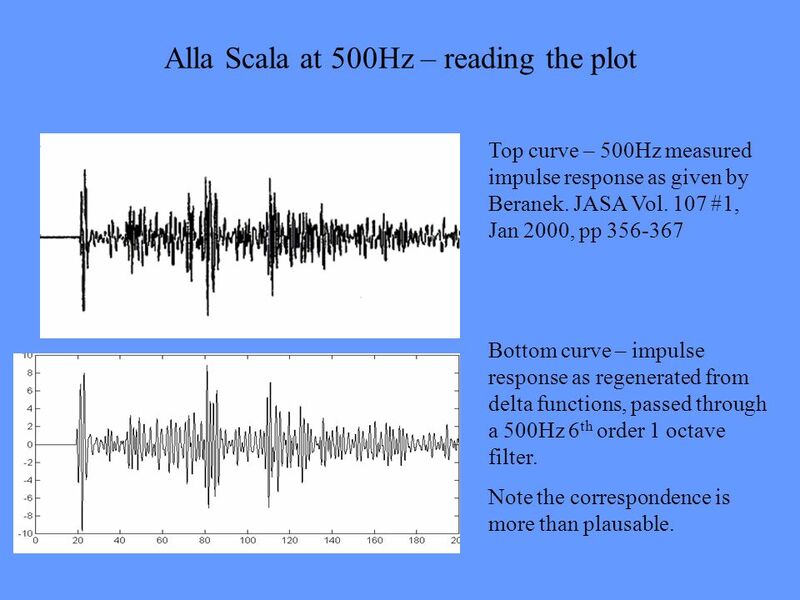 Top curve – 500Hz measured impulse response as given by Beranek. JASA Vol. 107 #1, Jan 2000, pp Bottom curve – impulse response as regenerated from delta functions, passed through a 500Hz 6th order 1 octave filter. Note the correspondence is more than plausable. 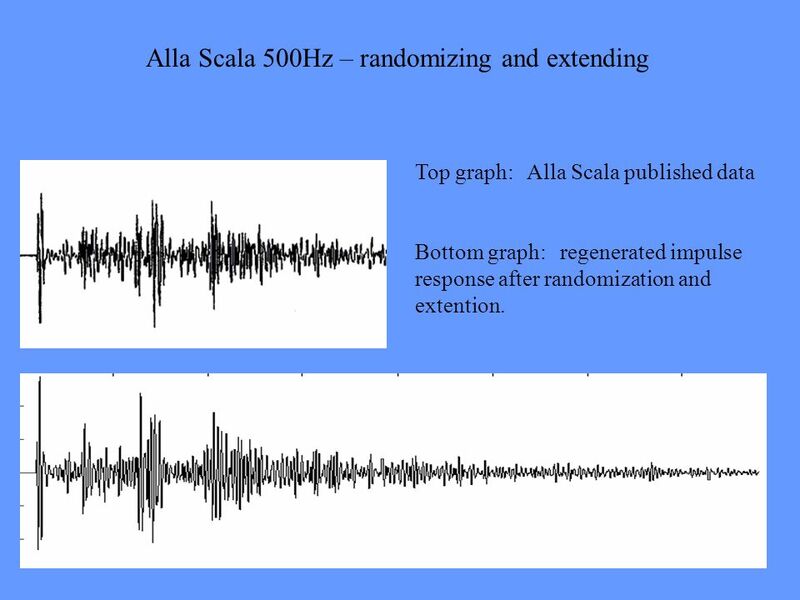 Top graph: Alla Scala published data Bottom graph: regenerated impulse response after randomization and extention. 1kHz Hz kHz 2kHz kHz kHz Note the excellent sharpness of the pitch peaks, and good consistency across bands. 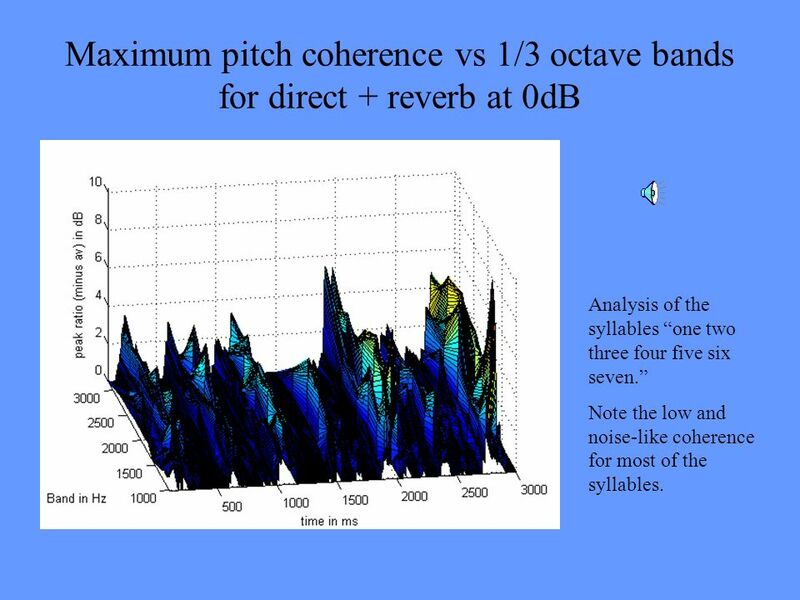 Pitch coherence is similar to our example where the direct/reverberant ratio ~=4dB While not as clear as in some examples, fundamental pitch is easily extracted using this simple detector. 1kHz kHz kHz 2kHz kHz kHz Note the peaks – where they exist – are very broad, indicating inexact pitch extraction. For most bands, there is no extracted pitch for all syllables. 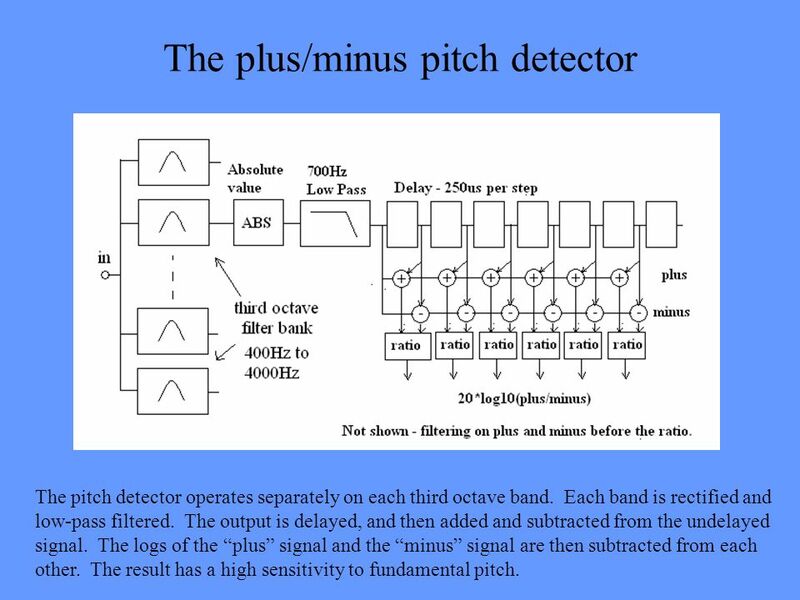 Fundamental pitch is not extractable using this simple detector. 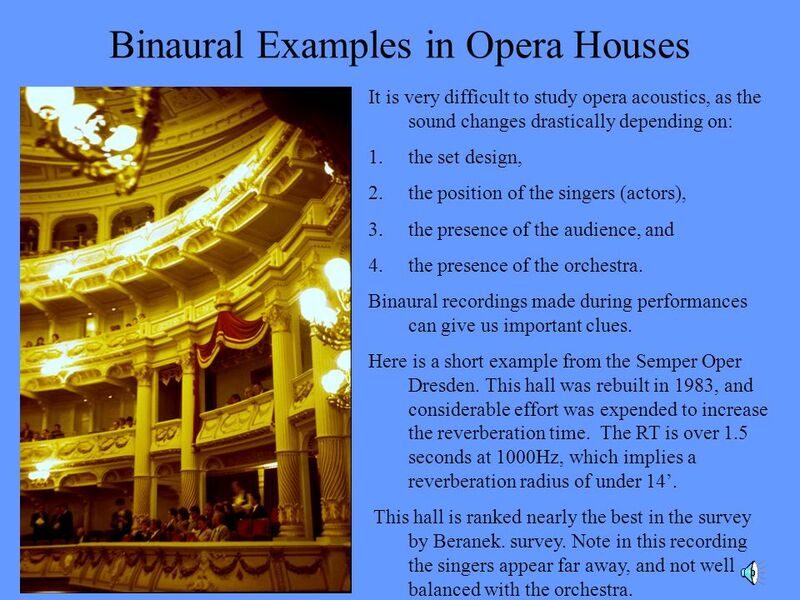 54 Conclusions We suggest that analysis of binaural recordings of speech during live performances is capable of yielding useful acoustic data – particularly for Opera Houses. A syllable counting method is proposed as a measure of intelligibility. This method can give information about low frequency acoustic properties. 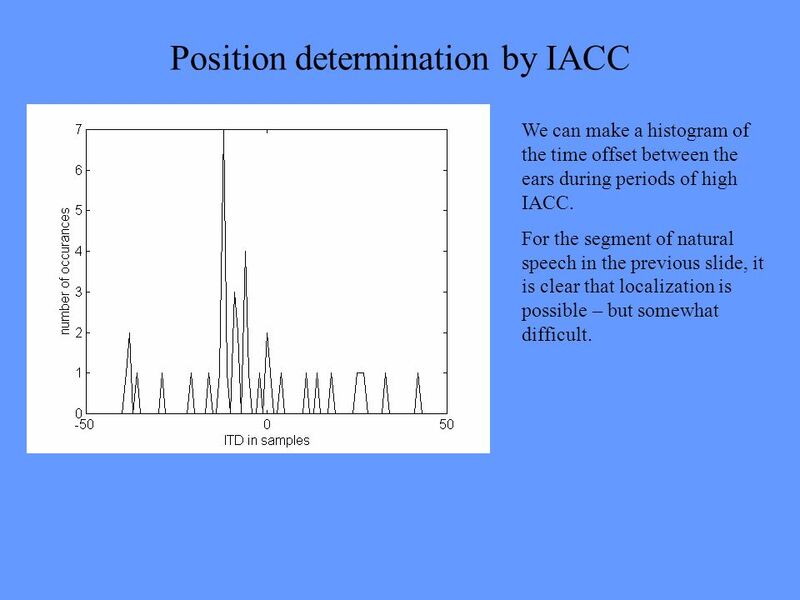 Running IACC – expressed as direct to reverberant ratio – is proposed as a measure of localization, and as a measure for the strength and timing of lateral reflections. This measure may be useful below 1000Hz in a dry hall, but usually is not. 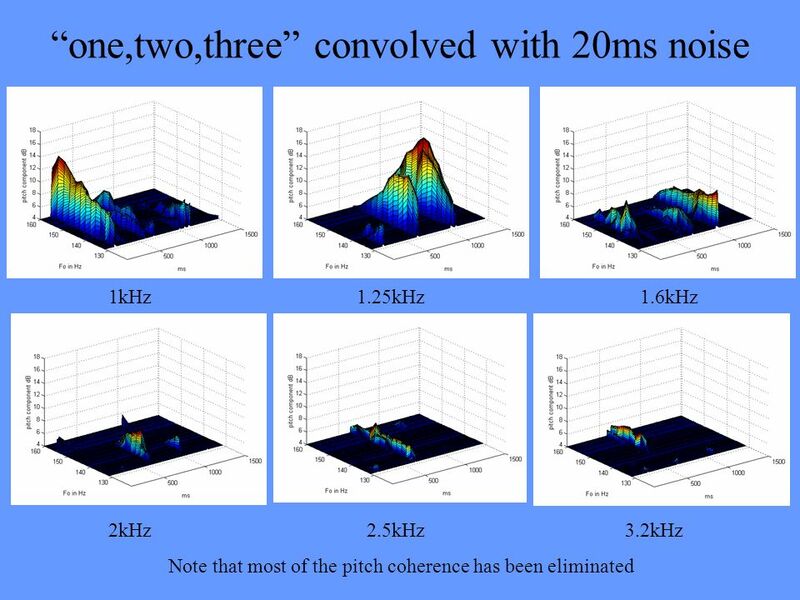 Pitch coherence (using methods still under development) is proposed as a measure of timbre quality and the strength and timing of medial reflections. Pitch coherence appears to work well above 1000Hz, and may not be easily measured or acoustically interesting below this frequency. Measures of reverberance and envelopment are possible, and will be shown in a future paper. We need good measures for frequencies below 1000Hz. 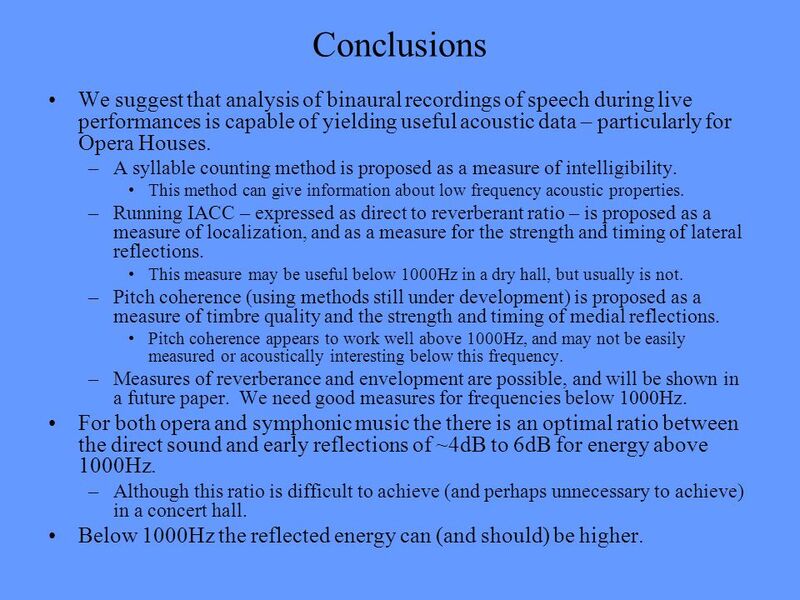 For both opera and symphonic music the there is an optimal ratio between the direct sound and early reflections of ~4dB to 6dB for energy above 1000Hz. Although this ratio is difficult to achieve (and perhaps unnecessary to achieve) in a concert hall. Below 1000Hz the reflected energy can (and should) be higher. 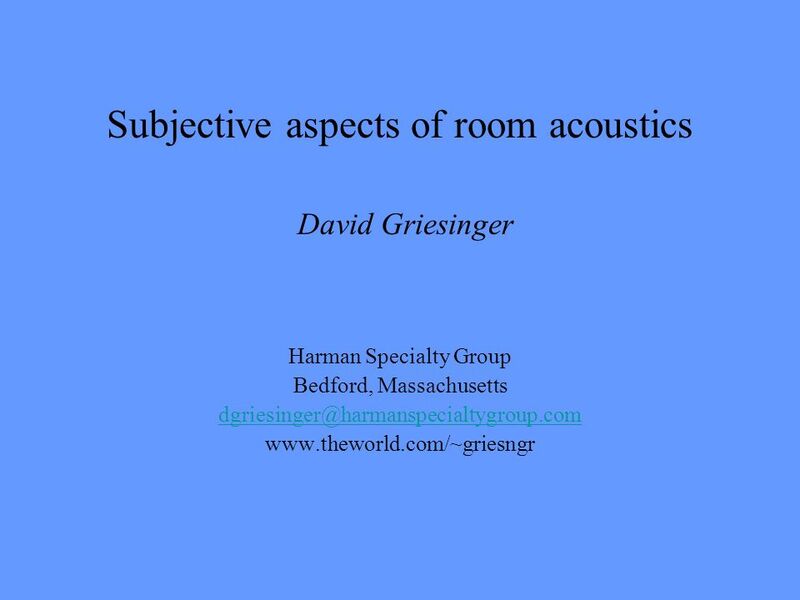 Download ppt "Subjective aspects of room acoustics David Griesinger"
The Relationship Between Audience Engagement and Our Ability to Perceive the Pitch, Timbre, Azimuth and Envelopment of Multiple Sources David Griesinger. Learning Introductory Signal Processing Using Multimedia 1 Outline Overview of Information and Communications Some signal processing concepts Tools available. Revised estimates of human cochlear tuning from otoacoustic and behavioral measurements Christopher A. Shera, John J. Guinan, Jr., and Andrew J. Oxenham. 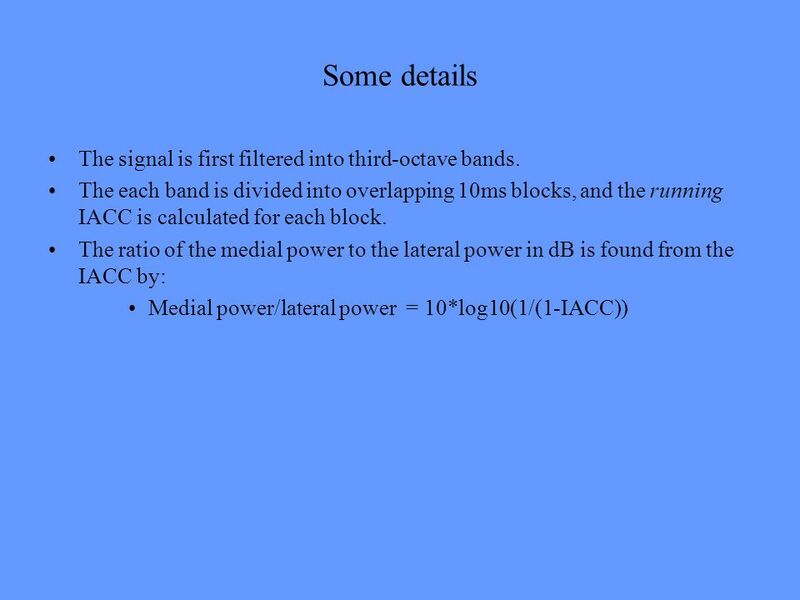 SOUND PRESSURE, POWER AND LOUDNESS MUSICAL ACOUSTICS Science of Sound Chapter 6. EE2F2 - Music Technology 4. Effects. Effects (FX) Effects are applied to modify sounds in many ways – we will look at some of the more common Effects. Hearing relative phases for two harmonic components D. Timothy Ives 1, H. Martin Reimann 2, Ralph van Dinther 1 and Roy D. Patterson 1 1. Introduction. V Telecommunications Industry AssociationTR L.